Frederick Morency is a seasoned executive in the power industry, with broad experience in North America and Europe and more than 15 years of service with Schneider Electric in a wide range of positions. His deep commitment to the industry, his international experience, and the breadth of management responsibilities with Schneider Electric have given Mr. Morency a unique understanding of the issues facing building owners and managers in today’s world. This re-engineering of the traditional BMS offers some key advantages of its predecessors: programmability and flexibility. Sinclair: Five years ago, nobody was talking about small and medium commercial building control. Yet today, even Forbes is spotlighting it in their publication. What has changed over this period of time? Morency: Many things have changed in building automation, but also in other industries. It used to be that companies thought about the very small, or the very large – residential or skyscraper. Nobody typically thought about what rests in the middle. Today, many new entrants look at the mid-market space and notice unanswered needs, which translate into business opportunities. You see it with companies like GoDaddy, that offer websites for small businesses, or with Intuit that offers payment solutions for the same clientele. In building automation, the mid-market opportunity is to offer energy efficiency and building control for small to medium sites. This can mean individual small businesses, multi-location retail, banking and restaurant chains, health clinics, or K-12 school boards. Most people don’t realize that these smaller facilities represent approximately 98% of commercial buildings in the USA. And until a few years ago, nobody was talking about that space because there wasn’t a solution designed specifically to bring value to it. That’s why we’ve introduced SmartStruxure™ Lite solution, which is a complete building management system (BMS) targeted at facilities between 1,000 sq.ft. to 100,000 sq.ft. It was designed with two ideas in mind; reduce the total cost of ownership of building management systems for smaller sites, while maintaining the flexibility that you have in traditional, larger systems. Sinclair: If traditional BMSs aren’t suitable for this mid-market, what is different about SmartStruxure Lite solution that allows you to get into those buildings? Morency: The main reason why traditional BMSs never reached the mid-market is because of fixed costs. There are gateways and servers in every system – you can’t go around them – that set the price point of any installation above what makes sense for a smaller facility. 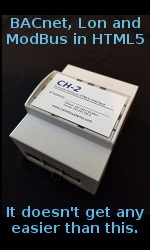 CAN2GO, a recent acquisition of Schneider Electric, changed this state of affairs four years ago by introducing the multi-purpose manager (MPM), which uses embedded software and modular hardware components to combine controller, gateway and server functionality into a single, affordable device. That is the backbone of lowering the total cost of ownership and answering the financial targets set by small and medium facility managers and building owners. This re-engineering of the traditional BMS offers some key advantages of its predecessors: programmability and flexibility. In the building automation industry, it’s understood that each building is different. The HVAC and lighting equipment is completely different depending on the region and climate conditions. The number of points and the needs will also differ between a restaurant on the highway, a small-town town hall, a mini-mall in the suburbs, a school in the city, a car dealership, or a health clinic sharing commercial space with a law practice and a mobile phone shop. Those are all different kinds of mid-market facilities that any system has to be able to adapt to. The only constant you’ll find in all these circumstances is that if you can reduce energy expenses, improve comfort, and reduce maintenance costs, the decision makers are ready to listen. The challenge is to maintain flexibility while achieving the lowest total install cost. Sinclair: Interoperability across applications and protocols has always been a challenge in building management systems. How is it addressed in these smaller buildings that make up this mid-market? Morency: That is the key, right? To address all the aforementioned differences, you need multi-protocol support without increasing price. This is why we’ve combined our modular hardware and embedded software approach to integrate the largest number of open protocols possible. Today, our MPM – which is about twice the width of an iPhone and a bit thicker – supports analog and binary inputs and outputs, Modbus®, ZigBee® and EnOcean®, and converts everything into BACnet® IP, and EcoStruxure™ Web Services. All the points, programmability, control, and visibility of the system is done through a web interface that is hosted locally by the MPM, but that is accessible remotely, like any large BMS. This enables management of a wide variety of equipment and systems, as well as peripherals and end-devices, across applications. By leveraging the deep portfolio of offers from Schneider Electric, the MPM can achieve the challenge of delivering best-in-class value for HVAC, lighting and metering. In HVAC for example, you get the full value of our room controller offer such as quick installation, efficient engineering, advanced control technology and scalability – and the flexibility brought by the MPM when they are connected by Zigbee Pro. Same thing for metering, where the MPM supports a wide number of the Schneider Electric power meter offers through pre-engineered objects, for efficient deployment and integration. Sinclair: What is the difference between SmartStruxure Lite solution and other offers you hear about for smaller commercial buildings? Morency: Going back to the realization that the mid-market exists, many companies are now taking a closer look at their energy consumption and realize how it can be turned into an opportunity. However, many tend to focus on single, limited applications without scalability or adaptability potential. That’s what you get with packages including a few “smart thermostats” tied to a webpage. This can be a good solution for a home, but as you move into commercial spaces with different equipment, different usage and different needs, you need to expand your scope, be able to adapt to specific needs, and integrate a wide variety of equipments and sensors. It’s also important to consider whether or not you can add lighting to that system. What about occupancy detection? A power meter maybe? And how deep can you configure this system to the particularities of the facility? A restaurant will have a customer area, a very hot kitchen, and some back office space. All these zones have to be managed very differently in terms of controlling the environment for comfort. In buildings like these, ensuring guest comfort is an essential part in maximizing the impact on the bottom line. A school has constant use of classrooms during the day for most of the year. The cafeteria, hall, and gymnasium are used more sporadically. Some classrooms won’t be used if they are under capacity, while there are portables if they are over capacity. Facility managers must manage each of these environments differently, again to maximize the bottom line. Retail stores may have different ratios of customer-facing space versus storage space. In an effort to enhance your customer’s shopping experience, the retail space must be comfortable. As such, your control sequence, scheduling and set point won’t be same throughout the store, which can grow pretty big under 100,000 sq.ft. Unlike other offers on the market, SmartStruxure Lite solution is uniquely positioned to address all these different mid-markets as well as their key solution benefits: openness, flexibility and scalability.